During the Halloween season, automotive enthusiasts love to revisit certain classic scary tales, like Steven King’s Christine and Steven Spielberg’s Duel. 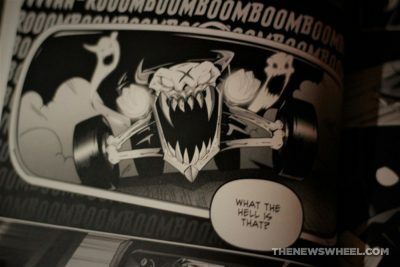 Inspired by such vehicular horror stories, a team of graphic artists and writers created an anthology of car-related frights. Edited by Devon Devereaux and published by his company Cackling Imp Press, Tales of Hot Rod Horror Volumes One and Two present stories of killer cars, demonic drivers, monstrous mechanics, and lethal road trips. Tales of Hot Rod Horror explores the wicked, forbidden nature of after-market car culture in a selection of monstrous comic book tales. Reflective of its inspiration, Big Daddy Roth, the graphic art anthology feels rebellious and subversive — the kind of comics your parents didn’t want you reading. Vol. 1 features 15 stories in its 110 pages, while Vol. 2 features 10. Thus, the second title features long, more developed stories with many of the same contributors returning. Readers may recognize the names (or styles) of Andy Ristaino, lead designer of Adventure Time; KRK Ryden, illustrator of DEVO’s magazine; James Suhr, storyboarder on Gravity Falls; Jeff Luther, visual effects designer for blockbuster films like Sin City; and cartoonist Rick Geary. Editor Devon Devereaux brought together many talented contributors of diverse backgrounds and genders. 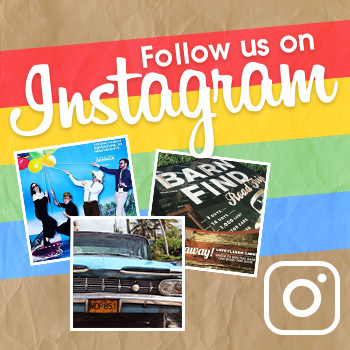 The contents involve hauntings, fictional urban legends, and tall tales all involving cars in some way (though a couple stories only loosely pertain to cars, with characters briefly driving in them). The types and age of the cars featured vary from tricked-out rat rods to vintage sedans. The artwork styles vary from pencil sketches to watercolors to digital animation. 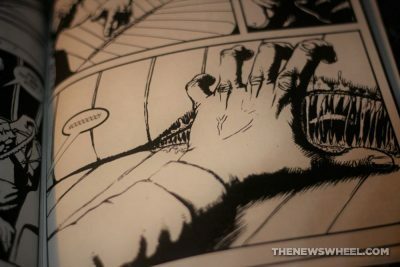 All of them are printed in black and white, which creates a foreboding atmosphere — especially the drawings that employ heavy shadows and pervasive inking. The success of each short story varies, as some hit the mark while others stumble due to confusing panels or panel-to-panel progression. Each reader will have to judge each entry individually to find the stories that appeal most to them. To me, the most effective were the ones with minimal dialogue that relied on building a Gothic aesthetic were best — like “Priorities” by David Settlow and “Speed Demon” by James Suhr. Other readers might enjoy the tongue-in-cheek, pun-filled satire entries. Clearly, the variety of styles reflect how diverse and eclectic Tales of Hot Rod Horror is as an anthology. Some stories are abstract, relying on surreal visuals, while others instill dread in a traditionally narrative approach. In all cases, ominous tones and grotesque visuals pervade the panels, punctuated by wry black humor that evokes the mischievousness of Halloween. Tales of Hot Rod Horror definitely appeals to a niche target demographic. Readers who love car culture will find this anthology imaginative, genuinely creepy, and a must-read tradition every Halloween. 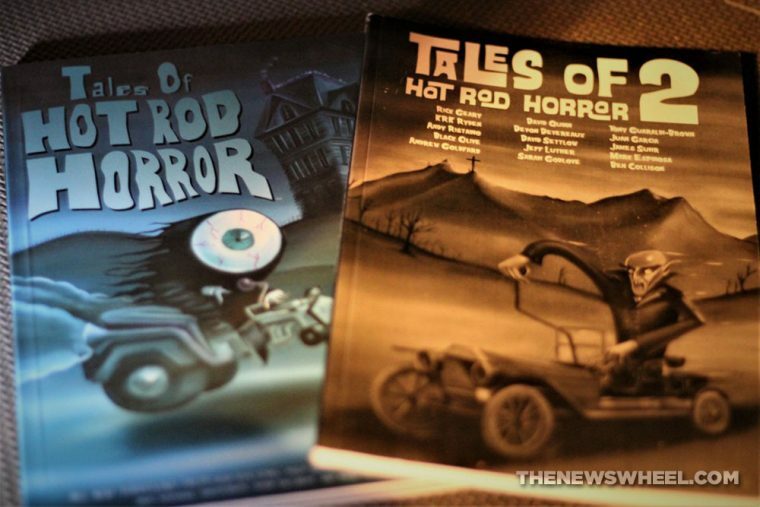 Tales of Hot Rod Horror is available through Amazon and other online retailers of used books.